It’s almost lunch time and the phones are lighting up in the IT department. The email system is down, and everyone from the President to the Receptionist is calling to say there’s a problem. Of course, thanks to your monitoring system, IT had already noticed that something was wrong, but the calls are providing immediate feedback regarding how widespread the problem is. Because email is a mission-critical system at your company, if the Tier 1 engineer cannot quickly fix the problem, your Information Technology escalation process will kick in. 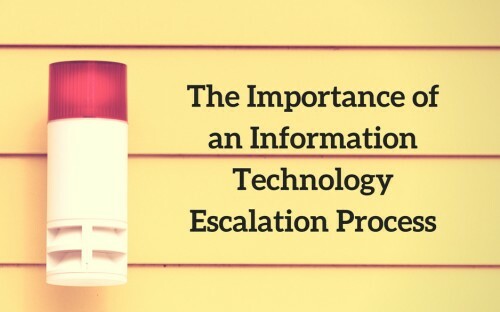 What is an Information Technology Escalation Process? An Information Technology escalation process is a formal process for addressing IT issues and problems when they arise. It is built on IT monitoring, which—when properly configured—will provide you with alarms and warnings whenever something is amiss. 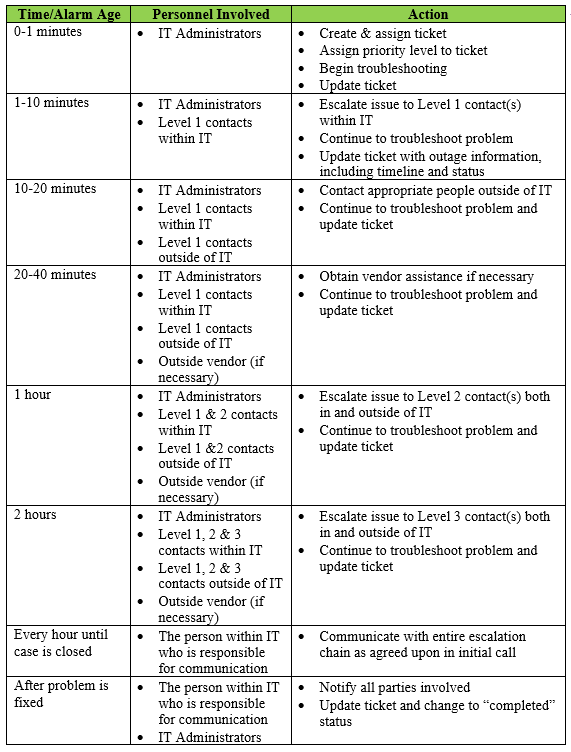 All IT departments should have a written escalation process in place, with the entire IT staff trained on its use. Your escalation plan should remove all guess work, making actual emergencies a matter of simply implementing decisions that have been made in advance. Your escalation process should assign priority levels to different types of issues (thus eliminating judgement calls), delegate responsibilities to specific personnel, and define how much time personnel at different support levels will spend attempting to fix a given issue before the problem is “escalated” to the person or people at the next support tier. Just as important, one of the purposes of the escalation process is to have a plan in place for informing and alerting those who are impacted by the problem itself. Within IT, who needs to be notified about a problem, called in to help fix the problem, or communicated with about the problem? Outside of IT, what functional groups need to be informed that there is a problem in the system that affects them and impacts the business? And who is responsible for making sure that all of this communication takes place? What are IT Escalation Drills? IT escalation drills are tests to see if your written process and plan actually work. When Coyote Creek runs IT escalation drills we like to create a mock situation, make it as realistic as possible, and then take the drill all the way through escalation to the highest tier contacts in the plan. Why? Because it is important that the drill not be confined to IT staff. To be most effective it must include everyone in the escalation chain company-wide. For clients of our Remote Monitoring and Management Service the process is a little different than what’s outlined above, because our escalation process involves people both within the Coyote Creek chain of command and at the client site. In most cases we will start by escalating issues internally before we escalate to the client. Why is Testing Your Information Technology Escalation Process So Important? Your overall goal is to avoid prolonged outages, and your Information Technology escalation process is there to help you reach that goal. However, even if your IT escalation looks great on paper, until you test it you won’t know if it actually works. Discover problems with your written processes – If you don’t run drills, you run the risk that you won’t discover your procedures don’t work or your contacts are no good until you’re in the middle of an actual emergency situation. Testing often uncovers flaws in the IT escalation plan itself, as well as problems with out-of-date information for the people in the escalation chain. It seems like when personnel change jobs or change their contact information, no one ever remembers to update the escalation plan. Gain proficiency – As the saying goes, practice makes perfect. IT escalation drills allow your IT personnel to get so comfortable with the triage, troubleshooting and escalation processes that it all becomes second nature to them. All of this practice helps your team to be more proficient at resolving problems more quickly, and at communicating effectively with everyone in the escalation chain. Realize you’re missing vital skill sets – Of course, it’s also possible that by running a drill you’ll discover that no one on your team has the ability to troubleshoot complex problems at all! Perhaps they’re excellent day-to-day administrators, but once the more “basic” potential root causes are eliminated, they are completely out of their league.If this is the case, the solution is to bring on an outside service company such as Coyote Creek to provide Remote Monitoring and Management services for you. For example, with our “Manage” service level we’ll take care of everything from basic monitoring to Level 2 technical service, all without any need to interrupt or alert your staff. If you want to be sure that your team is prepared to quickly and appropriately address outages and problems, running IT escalation drills is vital. If you need help getting monitoring in place, and/or creating and testing an IT escalation plan, give us a call. This is one of our areas of expertise.